WE ARE READY MADE : WHEN I GROW UP, I WANNA BE A KID! "[To] retain that innocence, that spontaneity, that sweet sense of fun". By these words, Katie Grand, editor-in-chief of LOVE, introduces Minnie Mouse as her cover-girl. And what a cover girl! She shares this brand new issue with such models as Cara Delevingne, Edie Campbell or Georgia May Jagger! Innocence/Spontaneity/Sense of Fun, these words seem to gain more and more importance in nowadays fashion. With the global crisis and an invading conformism leaching in people's minds, we really need Fun in Fashion because Fashion has to be fun after all! So we definitely need Minnie or models wearing Minnie's ears on the cover of LOVE as much as we need the collections of some of the most promising London designers, collections full of childhood images, full of innocence and sweetness even if as Miuccia Prada (the one who knows how to propose innocent and sweet collections) said in Schiaparelli & Prada: Impossible Conversations: "sweetness and innocence are obscene words in fashion". 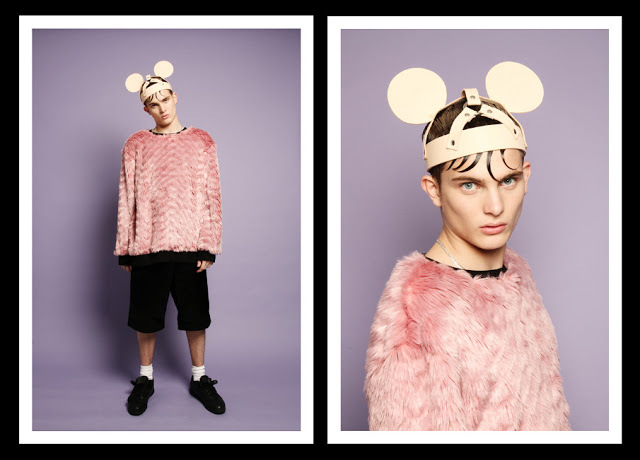 If someone knows how to work with the world of childhood fantasies, it's Bobby Abley, the London-based designer who graduated from Ravensbourne College and who loves referring to dreams and naiveness without being litteral. In his AW 13-14 presentation called Astro Abley, he proposed a streetwear collection with prints of planets, rockets and his totem teddy bear in a flying saucer. Let's start with that, the Teddy Bear, Abley's emblem whose origins are explained in the last issue of LOVE "The teddy bear my mum gave me [has] become my logo. It was given to her the day she was born and lived on her bedside no matter what. She gave it to me the day I moved to London". It is clearly an way to refer to the nostalgia of childhood and the transmission of what seems as the most important thing as a child. Everyone had a teddy bear (or whatever it was...), something that seemed a protection against the world, a heartwarming amulette that made us stronger and more self-confident. 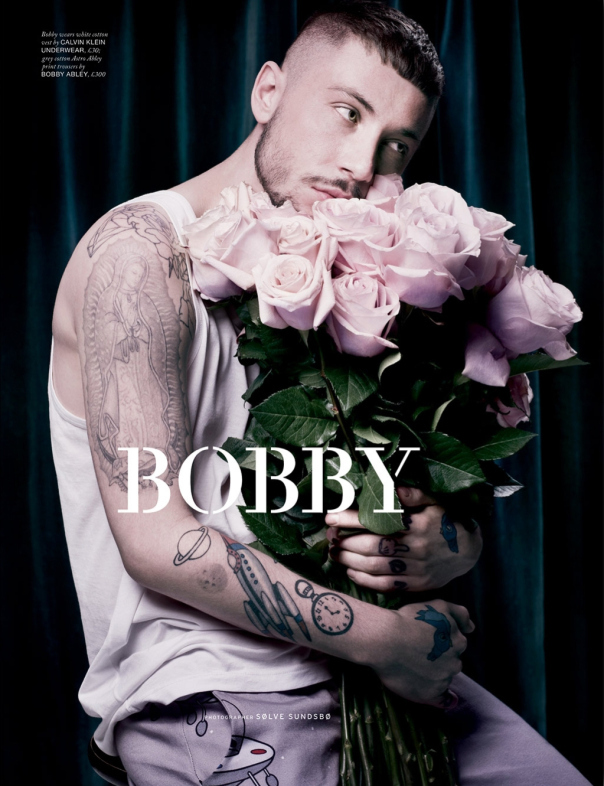 Bobby Abley's clothes are clearly referring to this innocent age when we felt invincible, this sweet age when everything seemed possible: travelling the galaxy, living in a fairy tale (in his first collection called Wishery and inspired by Snow White) or becoming a King/Knight of a faraway Kingdom (in his SS14 Collection entitled Knight Time). 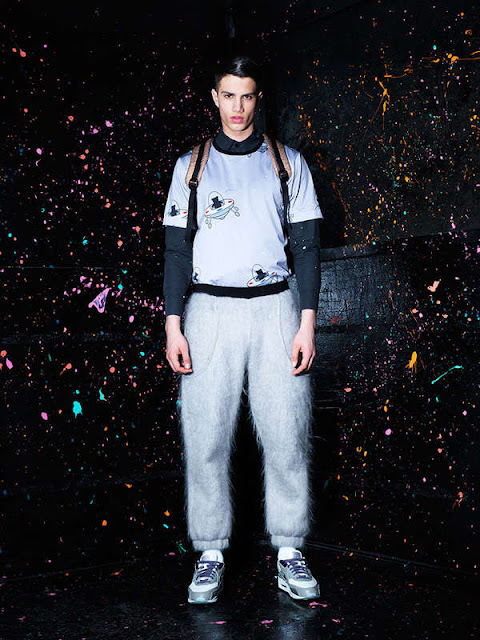 In these collections, Abley made easy to wear streetwear-style clothes just like sweaters and sweat pants, oversized tees, parka jackets and pieces (jumpers and pants) made of a strange material as if Abley had killed dozens of fluffy toys to make them but also giving us this same feeling of comfort, protection and self-confidence. A kind of armour for the grown-ups who want to protect from the adult world and are seeking for an alternative existence. An armour just like the tattoos Bobby Abley is sporting (Kermit, Snow White chirping blue birds, naive rockets and planets reminding us of a kind of young Marc Jacobs) and that seem to chant Devendra Banhart's lyrics "I feel just like a child! What's wrong with it?". Adult life is so boring , isn't it! Joseph Turvey is another British designer who tries to listen to what lies deep into his heart to propose collections challenging the classical (too classical?) menswear wardrobe (mainly the traditional 3 piece suit). Even if, his collections are not strictly speaking about childhood memories, about this nostalgia for past days of innocence, for the good old days when we were young and carefree, his AW13 collection clearly speaks to our kids' little hearts. 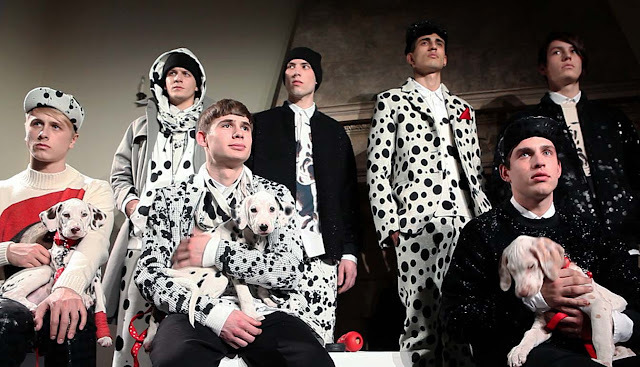 With this collection, Joseph Turvey makes Cruella Devil's wish come true by printing his clothes with the famous dalmatian coat. And there is nothing costumy to dress men as Cruella Devil's acolytes (we can see a parallel between this collection and the AW11 collection of Topshop Unique where models were also wearing this monochrome print), after all, the clothes are in black and white, nothing too extravagant here. 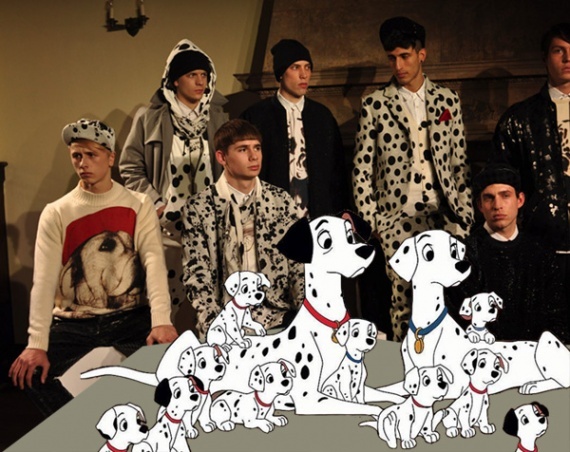 The London-based designer reinterprets the Modern Teddy Boy, the 50s rebel wearing creepers (and for the occasion, a dalmatian print). The giant dog head on the tees are also a reminder of a kid's spirit. Who, except children, is wearing big animal faces on one's top? Just like Bobby Abley, Turvey's work is always about the denial of conformism and here, thanks to the dalmatian print, the designer inspires a fresh breath of modernity and unconventional with his clothes. Reviving a certain feeling of childhood is not something new in Fashion. 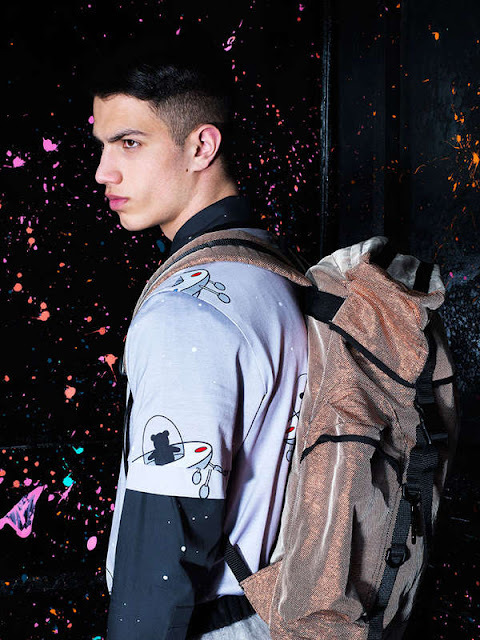 Such designers as Jean Charles de Castelbajac or Jeremy Scott have already proposed entire collections full of naive prints, or cartoonish characters but this new British avant-garde tells something more, something subtler. Their collections tell a lot about the designers themselves, the way they perceive menswear, the way they want to dress up men. Here, this is not the question of proposing "Harajuku" clothes that only extravagant people could wear. This is just the point of view of two designers who have a special connection to childhood and who want to be unconventional, unlimited and above all, uncompromising.